There is a saying that goes “It’s never too late to save.” It’s true, there isn’t a bad time to start saving for the future, but those who decide to start saving earlier are generally in a better financial situation than those that save late near retirement. This doesn’t mean that one should have to give up on the luxuries of life, but pick your battles carefully. Start saving just 10% of your income to start off. You will be surprise what that can accomplish over the course your your working life. So why is it so important to save earlier? The answer to that is quite simple. It’s called compound interest. Compound interest is a simple concept. It’s something that you learned in high school, but never really understood the application of it. How compound interest works is quite simple. It’s very much like building a giant snowball. You start off really small, but as you continue to grow it, it gets larger and larger. The rate at which the snowball grows increases because there is more area for the snow to stick to onto the snowball. 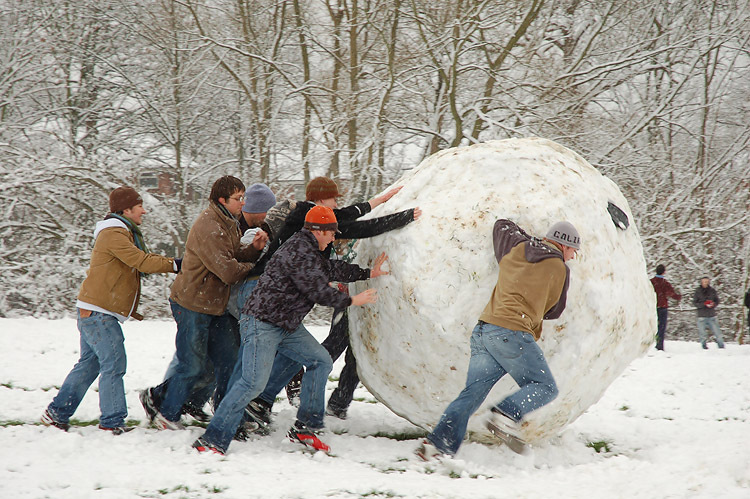 Eventually you have a giant snowball. Now apply the same concept to money. You can start small, very small. As you continue to save, the interest that grows on that money will start getting bigger. The interest that accumulates will also accumulate more interest, thus the money that you earn will start making more money for you. Continue on this pattern and you’ll be sitting on a mountain of cash. Sounds easy right? In order for compound interest to work effectively, you need to start early. The earlier the better. For sure we all like fancy cars, the coolest electronics, nice restaurants and the latest fashion, but delaying that purchase can make a huge difference in the amount of wealth you would build up using the power of compound interest. So how does compound interest work? Let’s examine the graph of how wealth is built for someone that invests $10 000 over 40 years yielding a very respectable 7% a year. 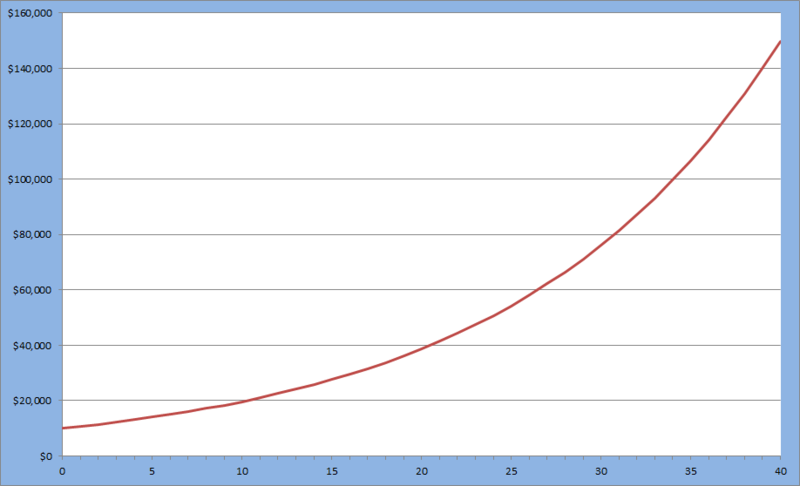 As the graph shows, compound interest is exponential in growth. What does this mean? It means that the growth of wealth is much greater at the end than it is at the beginning. By investing early, you are essentially taking advantage of the higher growth potential from the later years. The longer you are invested, the bigger your gains will be at the end. 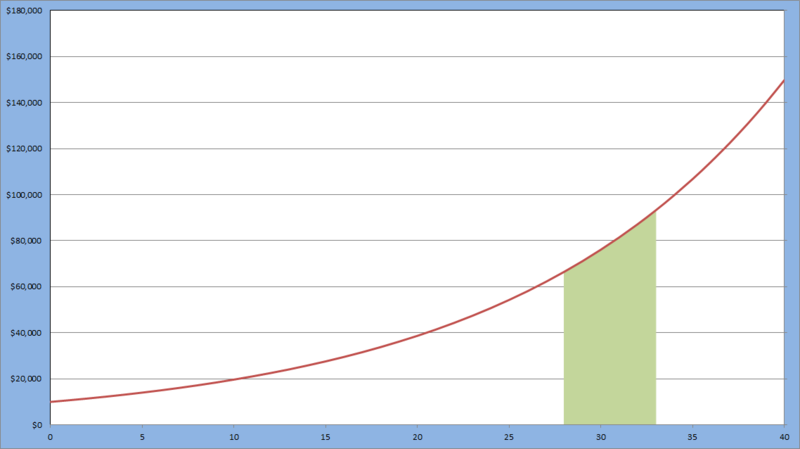 Once again the green area would represent the amount that the $10 000 would grow in that 5 year span. Notice how much bigger the area was if the money was saved when the person was 22 rather than 50. The difference is extremely large. 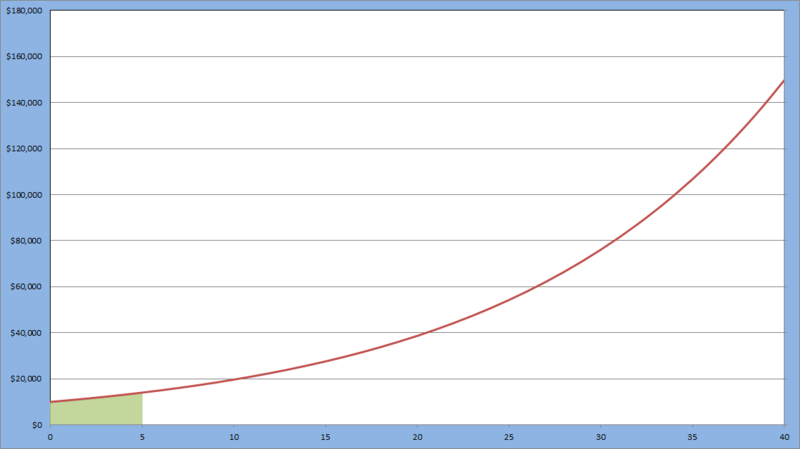 By starting to save at 50, the individual has lost 28 years of compound growth. When you start investing you don’t start further down the graph, you start at the beginning!! In order for the person that started saving at 50 to make the same amount as the person who started saving at 22, the investment made would have to be $66 500 not $10 000. That’s 6.65 times more money you would have to save at age 50 than at age 22. How’s that for a big difference? For someone that is young and starting to work, there will be many temptations that will lure your away from saving. An opportunity to buy a fancy car or the invitation to take extravagant vacations. Sometimes the small sacrifices that one has to make are all that matters to build yourself a wealth generating financial portfolio. Maybe instead of buying a brand new BMW, elect to go for a used one instead. Or perhaps sacrificing a trip to Europe for an all inclusive stay in Cuba is more financially prudent. Nevertheless, start saving early and let compound interest do its magic. ← My #1 Asset! My Car?